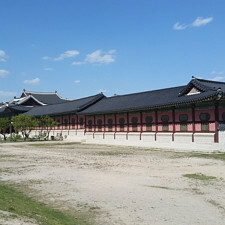 “Jokbal sounds good…” with a huge smile. That smile is what pushed me to make jokbal at home. I wanted to make something around his birthday, and enjoy eating what he loved to eat. 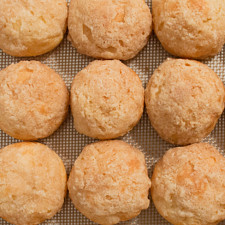 This recipe is for you, dad. I think you would be proud of this dish! 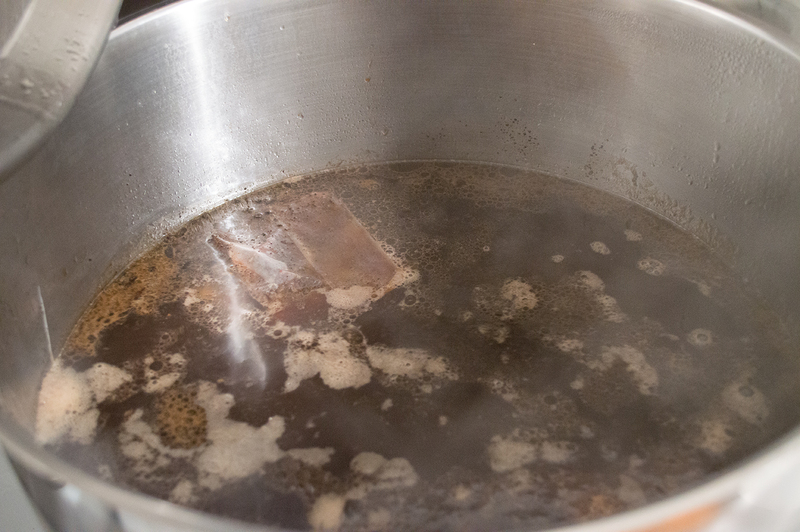 Wash the hocks in cold water, and place them into a large pot. 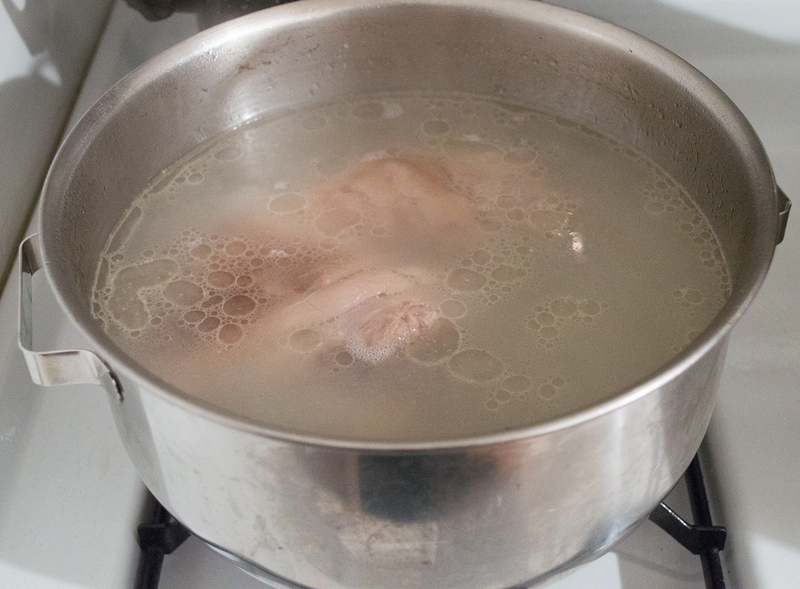 Fill the pot with water until the meat is covered, and bring it to a boil. Keep it at a rolling boil for 3 minutes. Turn off the flame, pour out the water, rinse the hocks, and refill the pot with 3-4 liters of fresh water. Bring it back to the range and boil. 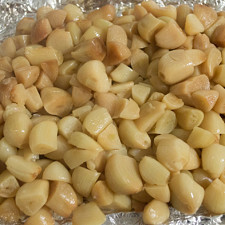 While the pork is coming back to a boil, wash and peel the daikon, and clean the ginger, leek, onion, apple, and garlic. Take the cinnamon, licorice, chilies, sand ginger, bay leaves, and star anise, and wrap them in a cheesecloth with twine, or a tea bag. Add all of the ingredients into the pot, bring the pot to a boil, and lower the flame to a steady simmer for 3 hours, or until the meat is tender. Fish out the meat and put them onto a cutting board to cool. While the meat is cooling, have the shrimp sauce and ssamjang prepared; wash the lettuce; thinly slice the garlic and jalapeños; take out some kimchi; and have some cold bottles of soju ready to go. After about 45 minutes, thinly slice the meat, place it onto a tray or large plate, and enjoy with friends and family! I like to give the pork a quick initial boil, to just cook away the blood and liquids remaining in the pork. It's best to do all of the prep work while the pork is coming to a boil. It will take some time to have the entire pot come to a boil, since there is a lot of water and meat that needs to go up in temperature. There is ample time to clean the vegetables and make your spice pouch. By adding all of these vegetables, fruit, and spices, they impart a good balance of flavors; the radish, leek, and onion help tone down the extra meaty notes, while the apple gives the entire pot some natural sugars. The herbs and spices also help with the overall flavor, keeping the meat from being too *barnyard-like* and lessening the fatty-greasy quality that can be off-putting for some people. 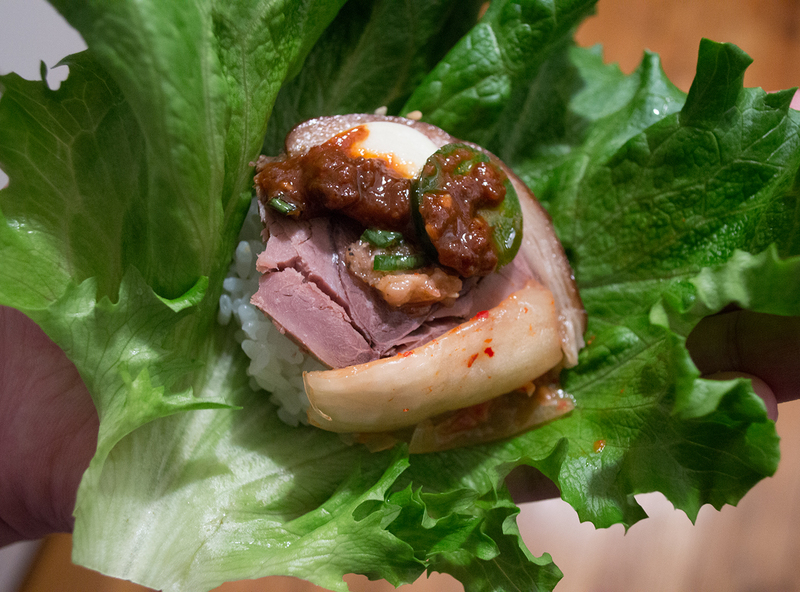 The meat should harmonize with the spicy garlic and jalapeños, and the zing from the kimchi. You are welcome to place all of the larger vegetables and fruit into a cheesecloth pouch, to make it easier to remove the bulk contents. 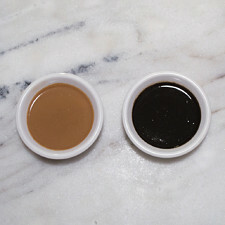 Otherwise, strain the braising liquid through a sieve and save the liquid for future jokbal. I put the strained liquid into the freezer, and thaw it out in a pot when I need to use it again. The hocks will feel a bit soft when pulling out of the braising liquid, so be careful when handling the meat. It may take a little longer for the hocks to cool before you can cut thin slices. Ideally, you will want the meat to come to room temperature before slicing. If you have a good, sharp knife that can cut the meat, you'll be able to slice the hocks while they are still slightly warm. 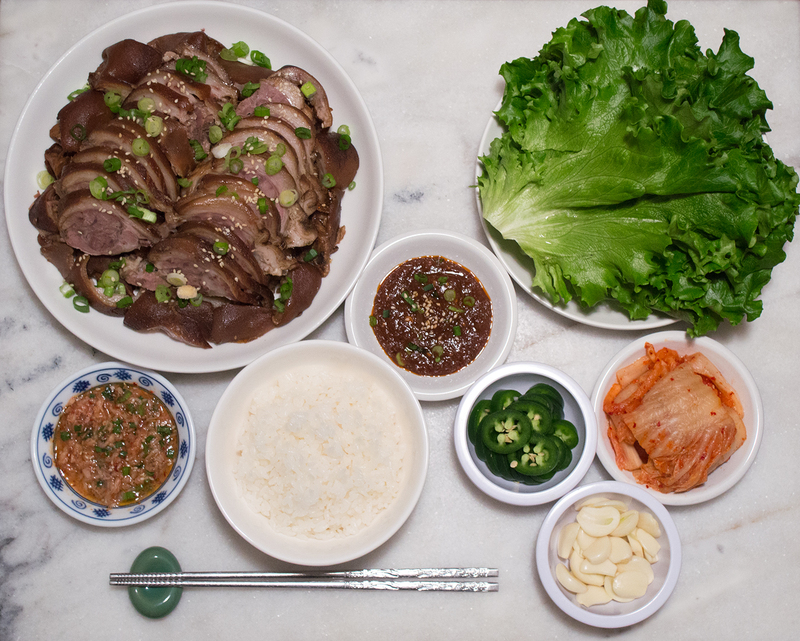 This meal is often taken as anju (안주), which basically means *food taken with alcohol*. 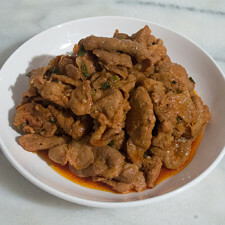 Jokbal is great for groups, and excellent when paired with alcohol, like soju. 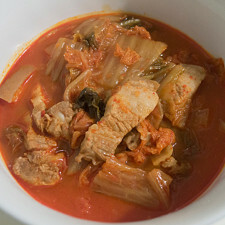 Made our Recipe for Jokbal (족발) - Braised Pork Trotters? Braising liquid for the pork. Full table setting for a delicious Jokbal meal. A lettuce wrap put together, ready to eat! 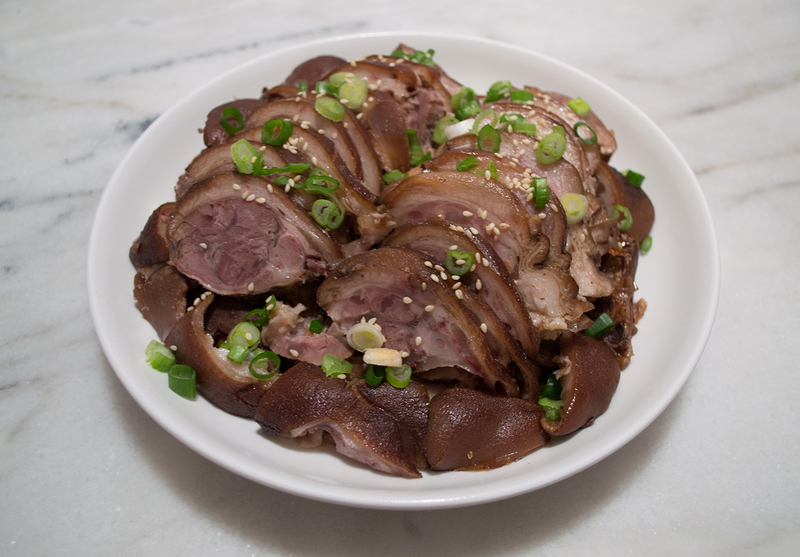 No thoughts on "Jokbal (족발) – Braised Pork Trotters Recipe."